Earlier rumors claimed that Apple would get rid of the 3.5mm headphone jack in favor of a thinner design, but this report claims that Apple will keep the same dimensions. More specifically, the claimed iPhone 7 ‘Pro’ will come in at 7.3mm thick, which is the exact same as the iPhone 6s Plus and thicker than the iPhone 6 Plus, which was 7.1mm thick. Additionally, the report notes that Apple will add a second iSight camera to the back of the device, which could perhaps be reasoning for keeping the thickness the same. Other details regarding the functionality of the dual-camera setup are scarce at this point, but we’ve seen several hints as to what Apple potentially has planned. As a patent hinted, one possibility with this setup is that with two camera modules behind the lens and a single lens with both standard and telephoto sections, you’d be able to switch between two different focal lengths. Another possibility is that one camera module could be shooting still images, while the other records video, taking the Live Photos feature of the iPhone 6s to a whole new level. Theoretically, you could also record normal speed video and slow-mo video at the same time with a twin-camera set up. 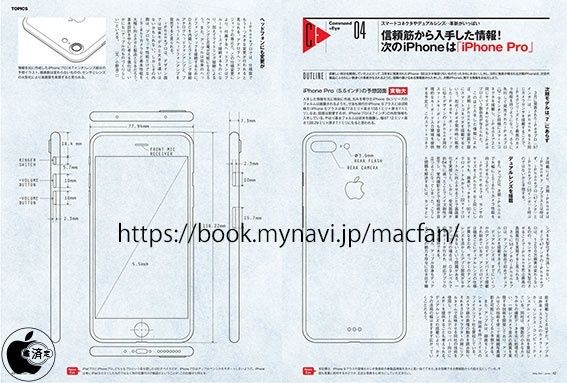 Finally, the schematics appear to show Smart Connector support at on the back of the device. This could allow for improved battery cases and docks, and given the apparent ‘Pro’ moniker, it would make sense for it to feature the capability. While today’s report should be taken with some skepticism, it does fall in line with what we’ve heard previously about the iPhone. Earlier this year, leaked images purportedly showed an upcoming iPhone with redesigned antenna lines and no headphone port, as well as dual-cameras on the back. Additionally, we saw images showing the Smart Connector last month, as well. It’s certainly risky on Apple’s part to keep the same design schematics yet still remove the headphone jack, as most customers will likely assume that no headphone jack means a thinner design. Nevertheless, it looks like the camera features could be the biggest selling point of this year’s iPhone update. You can read everything we currently know about the iPhone 7 here.